There are no butterflies yet, but the warmth of the new season is waking up the Earth. I always marvel at how nature keeps things growing, you know? Is such a miracle, so much magic, yet people walk by a wild flower without even stoping (weeds they say! ); they swat little insects that are pollinating, living, reproducing, and allowing all the little tiers of nature to co-exist and do their wondrous dance. We fairies know better than that. Our main job is to help. We are like the bees, that work in unison and always have the greater good in mind. It is hard to take decisions when you know one small thing can upset the balance, but we are trusted with this responsibility and we use our judgment as well as we can. Misty Willow, a nature worker. 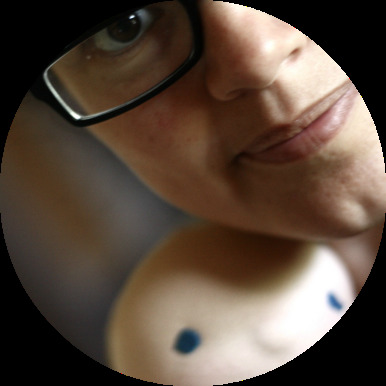 By Fig&me. Yes, we can be overbearing at times, some days I breathe on beautiful plants just to help them grow stronger (even though I know I shouldn't). I was told I am but a witness, and I should only come in when needed. Well, to that I say, that sometimes trampled plants need just a little pep talk, that trucks and people on their darn bikes are careless and I will help them out when they get down trodden. To not worry about that, they have me. I love plants and animals. Misty Willow has a lot to teach, and a lot to say, in regards to stewardship. I love her feisty nature, deep rooted in the love for the planet she so loves. She has a gentle touch with living things, and while she prefers to be outside, she knows that come Winter she needs to stay inside and let the Winter fairies do their work. She can be stubborn, and a little rude, but she is a noble soul. I love creating fairies. I don't make them as often as I wish, only because there is a legion of dolls that always get in the way. My fairies are a bit whimsical and not always "proper", but I think that just makes them more special: they come and go as they please, and there aren't many of them coming out of my hands, so I can concentrate the "creative juices" and bring them forth when time comes. 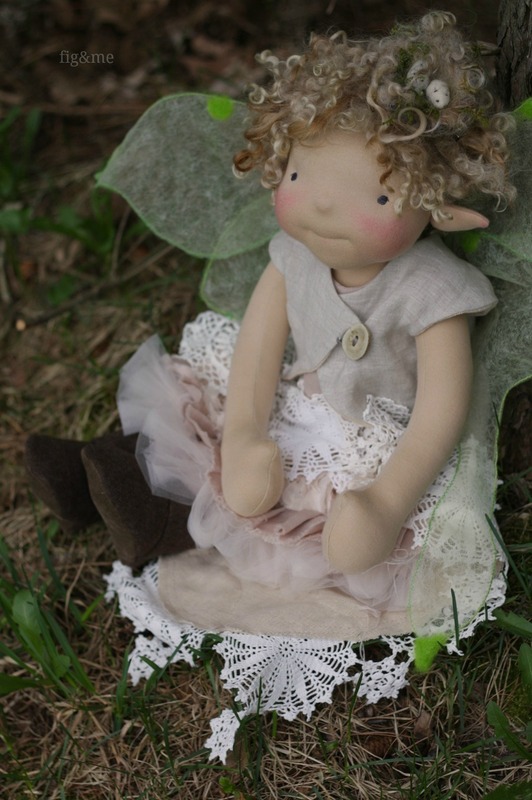 Misty Willow is a 19"/20" figlette doll, made with natural materials and one of a kind. She is made with cotton and stuffed with wool (very firm). Her hair is natural alpaca locks, sewn together into strips and crochet into a wig, then sewn to her head. She has a needle-felted sculpted face, with embroidered features. Her fairy ears are blushed, and so are her cheeks, with red beeswax. She does not have a sculpted bum or knees. She comes wearing a aged pink linen dress, with raw edges on hem and armholes, closes on back with buttons. The dress has hand-tucked raw edge ruffles made of linen and tulles; also she has applique crochet flowers. Her long linen jacket is lined with tea-dyed open weave cloth, with same crochet flowers appliquéd at the hem. There is a very wide pleat on the back that houses two magnets, which aid in keeping her fairy wings put. The jacket closes with a vintage reindeer antler button and handmade button loop. She is wearing wool boots with man-made suede soles, as well as jersey underpants. Her fairy wings are made of tulle and fusible web, and edged with floral wire and needle felted details. The wings have magnets that attach to the back of her jacket. The will not withstand rough play. As one last item, Misty Willow has a needle felted wool nest, that has alpaca locks and dry moss, and two specked eggs sewn in. The hair brooch is sewn firmly, and Willow likes to change it around her head. Misty Willow is a recommended toy for a child 12+ or an adult collector. Due to the magnets in the fragile wings, and the nature of her alpaca locks, I do not recommend her for a younger child, which would love to pull or tease her hair and keep fussing with the raw edged ruffles. Please be mindful of the age recommendation. Her detailed care instructions will be emailed to you upon shipment. If you would like to bring Misty Willow into your home, please fill the form below, and we will select a person at random tonight at 9 PM EDT to proceed to purchase. Her price is $652 USD plus postage charges (dolls travel with tracking number and full insurance, US $38, Canada $45, International $120). When the time is up, I will select a person at random to proceed to purchase by sending them an invoice through PayPal. —FORM HAS BEEN DELETED. This doll has found a home. Thank you! Thank you so much for coming to visit Misty Willow, and if you do open the doors of your home to her, thank you once again. I hope she finds a loving home, where she can keep taking care of Nature. I will see you all tonight!. Thank you to everybody that entered to give Misty Willow a home. She was very touched hearing that so many of you believe in fairy magic and that you are caretakers of the world around you. It will give her hope while she goes through her life. And above all, watch with glittering eyes the whole world around you because the greatest secrets are always hidden in the most unlikely places. Those who don't believe in magic will never find it. Roald Dahl.